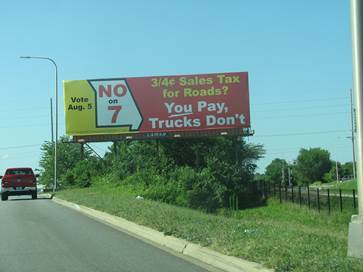 The Missouri election on a 10-year 3/4 percent sales tax increase for transportation is next Tuesday August 5th. Transit Action Network believes we shouldn’t pass a constitutional amendment to radically change the way we pay for roads and bridges. Section 30 of the Missouri Constitution states clearly that transportation projects are to be paid for with gas taxes, sales taxes on vehicle purchases, and vehicle license fees. We shouldn’t pay for roads based on how much we shop instead of how much we drive. Don’t let trucks off the hook. The trucking industry won’t pay hardly any additional taxes to fix roads and bridges based on this bill, yet they do the most damage. Missouri sales tax for everyone else will increase 18%. What happens to the difference between money collected and money spent on approved projects? There is a $1.3 billion difference between the $4.8 billion project list MoDOT put together to spend the receipts of this sales tax and the $6.1 billion of revenue Governor Nixon predicts the tax will generate. Our understanding is that MoDOT did not calculate any increase in the yearly sales tax revenue for the whole 10 years, which is an extremely conservative approach for estimating the revenue generated from this tax. Governor Nixon averaged a yearly 1.5% increase, which seems reasonable. In the bill HJR 68, which is what we are voting on with Amendment 7, our legislators instructed MoDOT to create a list of approved projects, to be paid for by this tax, to put before the voters. Once MoDOT runs out of that list, what happens to any remaining money, since the bill says it can’t be transferred to another account? Transit Action Network asked BOB BRENDEL, Special Assignments Coordinator for MoDOT and he replied, “According to the language in Amendment 7, revenues will be distributed into three funds: County Aid Transportation Fund, Municipal Aid Transportation Fund, and the Transportation Safety and Job Creation Fund. In the event there are additional funds available beyond the estimated amount, the funds would be distributed across the state based on the approved distribution formula.” In other words, MoDOT can build whatever it pleases with potentially an additional $1 billion, not just the approved projects. That is not what legislators intended. Passing this bill may give MoDOT up to 1/6 of the tax money to build whatever it wants. So why is the sales tax increase so much? MoDOT Director Dave Nichols says he needs an annual construction budget (i.e., the money over and above routine operations like mowing and maintaining signs and signals and such, to replace worn-out sections of roads and bridges) of $485 million, and that beginning in 2017 MoDOT expects to have only $325 million. That’s a shortfall of just $160 million annually, yet Amendment 7 would give MoDOT nearly three times that amount. Why so much? Ask the highway construction lobby! This entry was posted on July 30, 2014 at 8:10 PM	and is filed under Action, Regional Transit Issue. Tagged: MoDot. You can follow any responses to this entry through the RSS 2.0 feed. You can leave a response, or trackback from your own site.